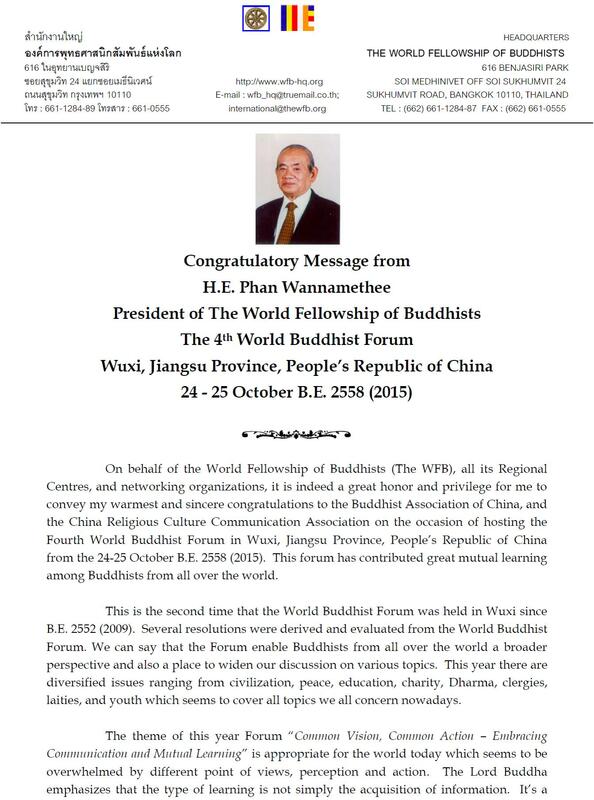 On behalf of the World Fellowship of Buddhists (The WFB), all its Regional Centres, and networking organizations, it is indeed a great honor and privilege for me to convey my warmest and sincere congratulations to the Buddhist Association of China, and the China Religious Culture Communication Association on the occasion of hosting the Fourth World Buddhist Forum in Wuxi, Jiangsu Province, People's Republic of China from the 24-25 October B.E. 2558 (2015). 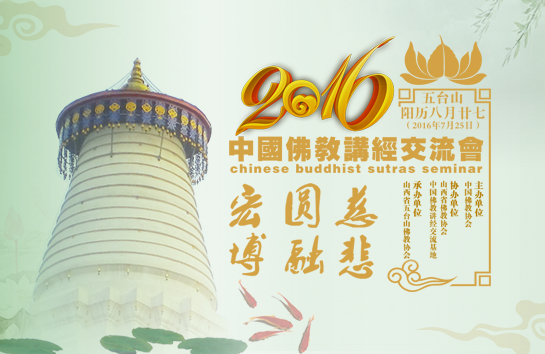 This forum has contributed great mutual learning among Buddhists from all over the world. 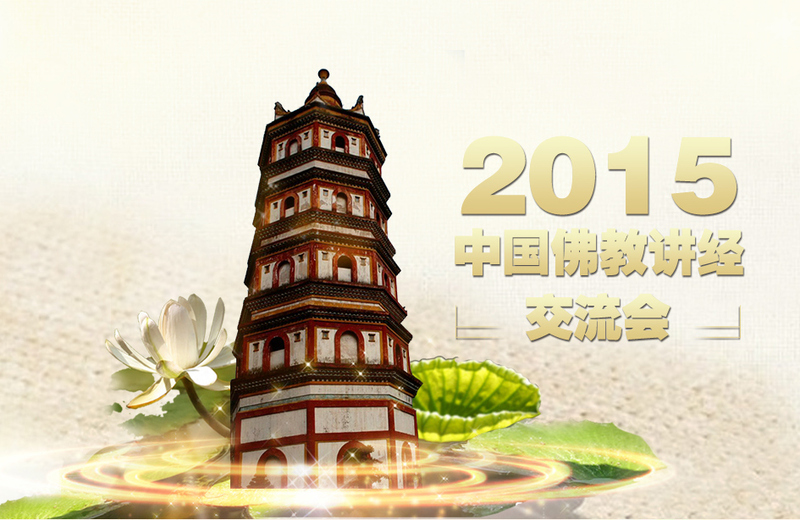 This is the second time that the World Buddhist Forum was held in Wuxi since B.E. 2552 (2009). 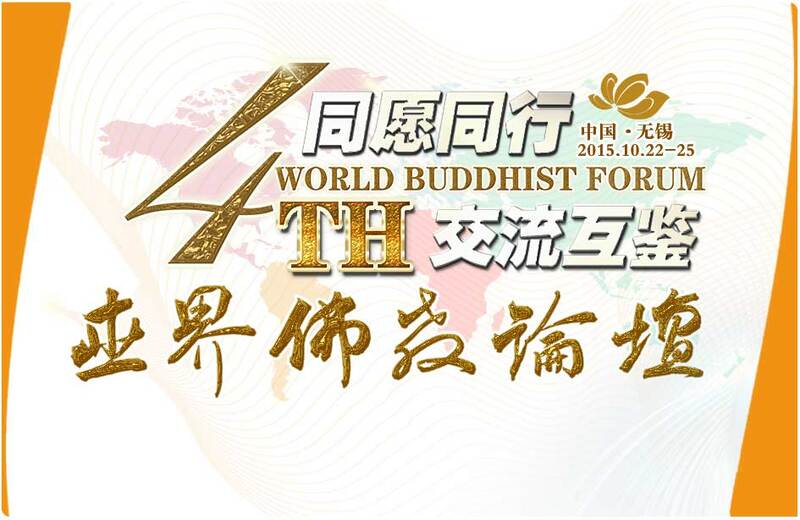 Several resolutions were derived and evaluated from the World Buddhist Forum. 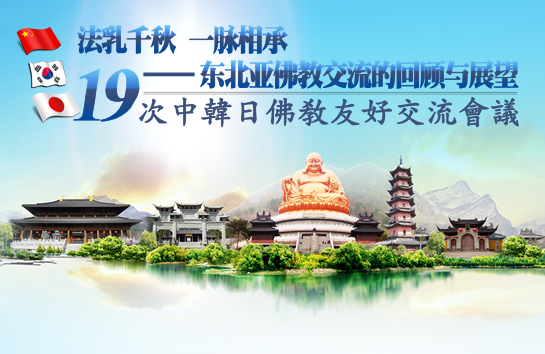 We can say that the Forum enable Buddhists from all over the world a broader perspective and also a place to widen our discussion on various topics. This year there are diversified issues ranging from civilization, peace, education, charity, Dharma, clergies, laities, and youth which seems to cover all topics we all concern nowadays. The theme of this year Forum "Common Vision, Common Action – Embracing Communication and Mutual earning" is appropriate for the world today which seems to be overwhelmed by different point of views, perception and action. The Lord Buddha emphasizes that the type of learning is not simply the acquisition of information. It's a skill leading to total release from suffering and stress. Learning is possible only where there is feedback. Communication is the purposeful activity of exchanging information between two or more parties in order to convey or receive the intended meanings. Therefore, communication is very essential in convey information in a positive way. In Buddhism there are precepts of Mindful communication which is the practice of bringing our attention to our words. It means we are aware of what we are saying while saying it. It is a practice of observation and not evaluation. It is paying attention to others on purpose with a moment-to-moment awareness. Above all openhearted communication and dialogue with mutual understanding of loving kindness will be the best mean to find solutions to all difficulties. Thus, Buddhism is perhaps unique in the central role it accords human-to-human communication. The Buddhist teachings of moderation, tolerance, compassion and perseverance are widely uphold and practiced. It certainly builds up strong and positive moral in the society so that people can live together peacefully. 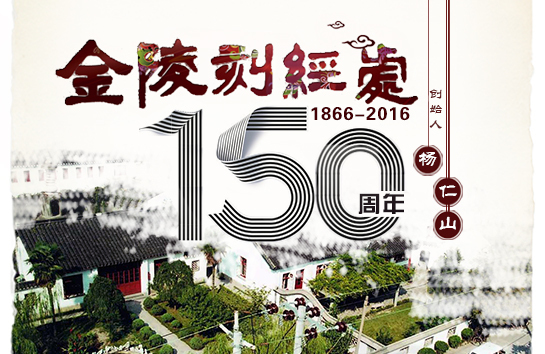 The World Fellowship of Buddhists, since its establishment in B.E. 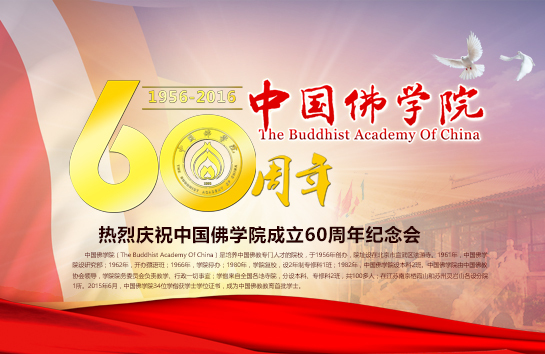 2493 (1950), is continuously working towards its aims and objectives to propagate the sublime doctrine of the Buddha, work for happiness, harmony and peace on earth and to collaborate with other organizations working for the same ends. 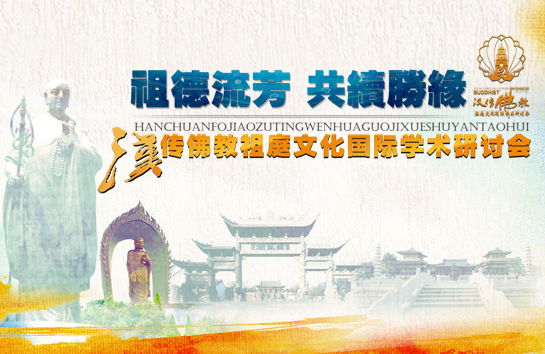 I hope this Forum will enhance unity between Buddhists and non-Buddhists. We truly believe that together we will be able to generate a positive effect in the community and at an international level as well. 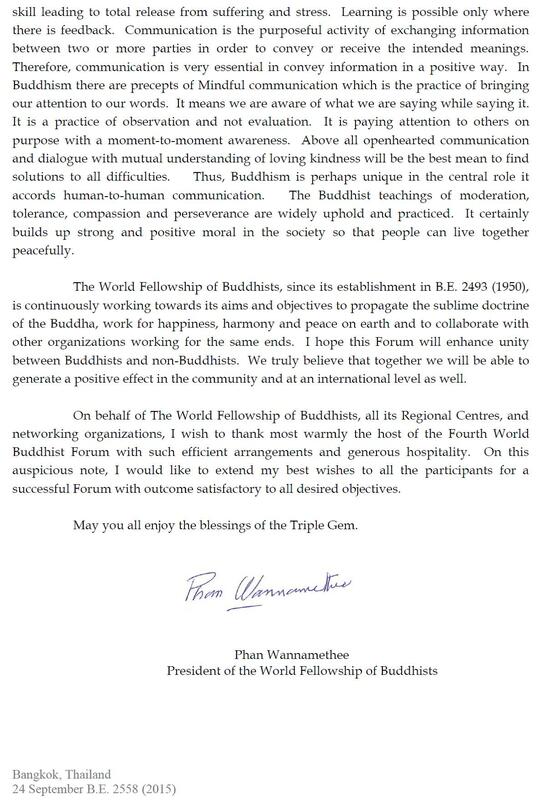 On behalf of The World Fellowship of Buddhists, all its Regional Centres, and networking organizations, I wish to thank most warmly the host of the Fourth World Buddhist Forum with such efficient arrangements and generous hospitality. On this auspicious note, I would like to extend my best wishes to all the participants for a successful Forum with outcome satisfactory to all desired objectives. May you all enjoy the blessings of the Triple Gem.